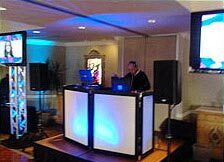 Our DJ's and Master of Ceremonies have the experience to create an atmostphere of sophistication and elegance while setting the mood for a fun and exiting good time. This is Jenny from the Princess Lady from Saturday night. I again just wanted to thank you for doing such a great job! I have your information and look forward to working with you in the future. Thanks! Thank you for the great Job you guys did at my Wedding, the uplighting was so beautiful, thanks again for making it that much more special. "Top notch all the way" Just wanted to thank you for the wonderful Job you did on Saturday night, Everyone had such a great time and its all because of you! As soon as we choose a date for next year, Ill be in touch . Hello Izzy! This is Jenny from the Princess Lady from Saturday night. I again just wanted to thank you for doing such a great job! I have your information and look forward to working with you in the future. Awsome Job, everything was terrific, you did everything we asked you to do right, and everybody had a great time, we couldent of asked for anything better . 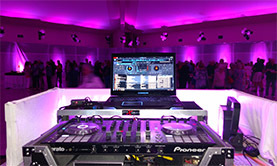 DJ Izzy, Thank you for doing such an awsome job at our wedding, you rocked the house, we had an awsome time, I know we are biased but that was the best wedding we ever been to, you made our night, you got such a great personality, you are an awsome guy and we are going to recoment you to everyone. Izzy what a phenominal time we had, you are such a great guy, with such a respectfulness for God, you took us right to the line of being so much fun yet never crossing it, and keeping it respectful, you created such an amazing time for us, thank you so much for allowing us all to have such a great time, we love you Izzy! 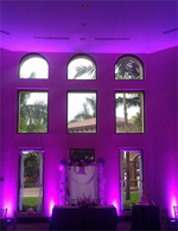 We are South Florida UpLighting rentals in Ft.Lauderdale, with L.E.D. Uplighting, and Professional Ambiance Lighting for Weddings, Quinces, Mitzvahs and special Events in Ft.Lauderdale, Florida. We specialize in L.E.D. 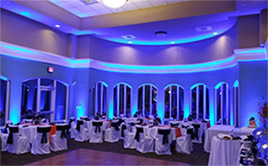 UpLighting rentals, Ambiance Lighting and Professional Lighting for special Events, such as Weddings, Quinces, Ceremonies, Corporate Events , Proms and School dances in Ft.Lauderdale and all of South Florida. There is no Uplighting job too big or too small! We can make beautiful things happen with Uplighting at your next Wedding, Quince, Corporate function or Special event. We can Up light up your next event, and light up the walls and ceilings so they glow any color or any combination of colors you choose, to match the Up lighting colors to your special theme. We also offer customized lighting Monograms on the walls or on the dance floor, with the Bride and Grooms names, company Logos, etc., click below link to see an example of this. And of course we also offer DMX controlled Up lighting, Intelligent dance floor Lighting, DJ's/MC's, Video, and Photography, for your special event. Let us create a special discounted package for you, and deal with just one reputable and dependable company for all of your entertainment needs. We will be happy to meet with you to discuss your specific needs, and put a package together that will suit your budget. 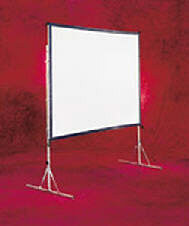 Uplighting prices are $35.00 per each Tri-L.E.D. fixture, Free delivery and set up with 10 or more fixtures, and special discounts available for bundling with any other service we provide, such as DJ/MC, Photography, Video, etc. L.E.D. 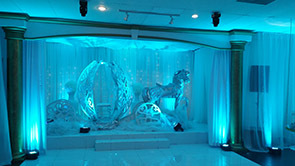 Tri's Uplighting rentals is our specialty because they run cool and do not burn to the touch, yet create a beautiful powerful glow wich will illuminate the entire room, LED Uplighting is the way to go if you want to add Glamour to your event, and create that Wow effect, or "Wow factor", we offer a Wholesale Up lighting service and Ambiance Lighting rental, and Professional L.E.D. Tri's Par64's UpLights, and provide it at reasonable prices. You don't have to be rich to afford uplighting, anyone can afford it and everyone should have it at their special event. 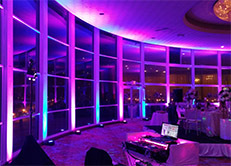 AAAUltrasound Productions offer a reliable uplighting rental service, and pride ourselves in creating Gorgeous and glamorous lighting effects for walls and Ceilings to match your color theme, or decor. UpLighting is very popular for once in a lifetime special events, like Weddings, Quinces, Sweet 16's, Aniversaries, Corporate events, or any special function where you want to create a Glamorous and Ellegant look, or feel, it is especialy requested for Wedding Receptions, Quinces, Ceremonies, Proms School dances, Corporate events, because they usualy require Elegance and Glamour, but you can use them for birthday parties, proms, and any other event as long as the budget is there for it. We highly recomend Uplighting as a way to affordably create that shock value Glamorous look without breaking your pocket book, so it is a no brainer for the georgeous look it creates, it is worth every penny of your investment, and that is my honest opinion, and not a sales line, I honestly believe it, and that is why I got into the business in the first place, because I believe in Uplighting and what it can do for you on your special day, and I know what a huge difference it can make for such an affordable investment. UpLighting has been slowly gaining popularity for years now, but lately it has become the in thing, in other words you can't compete unless you have Uplighting, because with out it your wedding will be plain compared to the others that rent up lighting, it's just common sence, any wedding or special event that doesnt rent uplighting is missing something very important that those type of events need, its missing elegance, Glamor, luxury, the wow factor, and all the money you spent to impress your friends means nothing if they are not impressed, because they most likely have recently been to a wedding with uplighting, and if they walk into yours and dont see uplighting, they will not be impressed, because once you see an uplighted venue any other venue is pale in comparison, and the funny thing is I really believe what I am writing here, "this is not a sales line to get your business! ", it is just the plain facts. Now if you are one of these people who want to keep it humble, and dont need to impress everyone, then why not just have a party in the back yard and cook burgers?, lets not be silly, a wedding is an important day and requires a bit more extravagance, and its common sence that you are going to try and make it as special as possible because these type of events are mostly once in a lifetime events, so why not go all the way and yes impress everyone with the Wow factor, take it to the extreme, especialy if it is affordable enough, and with us uplighting is affordable. AAAUltrasound offers wholesale Uplighting, yes you heard me right, Wholesale!, that means you could go to any other lighting equipment rental company, and rent these L.E.D. Up Lights to set them up yourselves at your party, and actualy pay them more $ for just renting them, than what you pay us for the entire service of delivering them to you, setting them up artisticaly, and tearing them down and picking them up after the party is over, with out you having to do a thing but pay one flat fee, so its really a no brainer, because if you can dramaticaly add glamor and have such a huge effect on the look and feel of your event for such a small price tag, it would be dumb not to do it, realy, I mean you would really have to be either completely broke, or just plain dumb to pass on our uplighting specials, cause we got deals hard to beat. If you bundle and purchase any of our other services, like: DJ/MC, Up Lighting, Photography or Videography from us and "bundle" you save big on your UpLighting rental, so call us today and make your special day extra special. Call us for an appointment so we can discuss your ideas, we can make your visions into a reality. We also provide quality Video projection systems, wireless microphones, DJ/MC's, Photography, Video, Photo booths, event decor, etc., so you can shop in one place for all your needs. Acces to Location 2 Hours before event start. (2) 15Amp 110V Wall Outlet. We serve: Ft.Lauderdale, Miami, Boca Raton, Deerfield Beach, Weston, Davie, Parkland, Miami Beach, West Palm Beach, Miramar, and Pembroke Pines, Coral gables, Doral, South Beach, Boca Raton, Ft.Lauderdale, West Palm Beach, Boca Raton, Deerfield Beach, Pompano Beach, and Plantation, Davie, Parkland, and Sunrise, Weston, Hialeah, North Miami Beach, Miami Gardens, Tamarac, Green Acres, as well as all of Dade County, Broward County, and Palm Beach county Florida.